Here at Atlantic Yacht Basin, we have seen it time and time again in the nearly 80 years we have been taking care of boats. 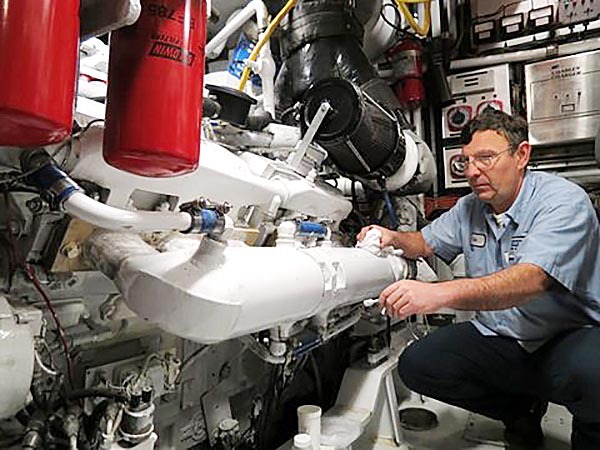 A boat owner brings his or her vessel to us to investigate a transmission that is balking, or an engine that is making an unusual noise or — in an extreme case – when the vessel has been towed to AYB following a catastrophic failure. The owner may tell us that everything was fine until it all went downhill quickly. Oil is added regularly, fluids are changed at recommended intervals, and the owner is religious about watching the gauges when underway. So what happened and why? Chances are, the owner believes the maintenance schedule has been followed. But if regularly scheduled fluid analysis has not been part of the maintenance plan, then the saying of “what you don’t know can hurt you” has never been truer. A small sample of oil from your engines and generator, fluid from the engine cooling system, hydraulic systems and more gives you and us an extremely accurate picture of the health of the heart of your vessel—the mechanical systems that endure friction, heat and stress. We send these samples to a laboratory with details—the more the better—about the equipment from which the fluid was drawn. Sophisticated lab instruments can detect a wide range of microscopic alloys and pollutants. For example, an engine oil sample with a higher than normal level of iron may indicate wear from rings, valves, gears and other internal engine components. A spike in the amount of aluminum in the sample may indicate piston or bearing wear. Presence of fuel in the engine oil sample likely indicates a fuel injector that is dripping fuel, instead of emitting an extremely fine spray. An oil sample can even tell you and us if your engine isn’t breathing well. High levels of silicon can indicate too much dust and dirt is getting into your engine – which means you need to check the air cleaner more often. 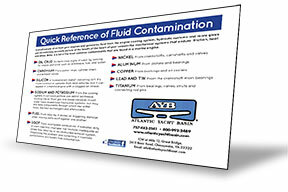 Click Here to Download a Reference List of the Most Common Fluid Contaminants.